We all know, thanks to Robert Plant and company, that communication can break horribly down. 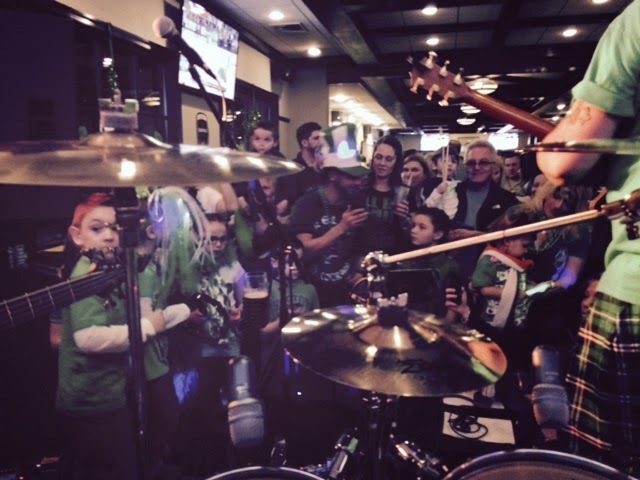 But is it possible that a man, in his sixties, could have really believed, on St. Patrick's Day, that I had invited his two-year-old grandson to sit in with the band? I was setting my drums up for the evening, and up he came with the boy -- the boy who was clutching a pair of 5A, nylon-tipped sticks in his cute little mitts. I smiled at the two of them. "He wanted to see the drums," the man said to me. "His grandpop is a drummer. This kid loves drums. He sleeps with these sticks in his hands." Anyway, I waved at the little fellow and said, "You want to come up and try the drums out?" Okay, I figured -- the kid got cold feet and they want back to their dinner. No biggie. We played through the first set and, for the first time in my playing career, our most energetic audience was an entire extended family, from two to sixty-something, jamming out, right in front of the stage, including Little Buddy Rich and his granddad. And, yes, that is a kilt Jeff is wearing. And, no, I wasn't wearing a kilt. When the second set started, they were back. As we were walking up, Cindy, the wife of Tony, our other guitar player, told me that an older guy had asked her if she was a wife of someone in the band. When she said yes, he told her that "the drummer" had promised his grandson could sit in with the band. Cindy was mystified by this, delivering the message she had to deliver, but fully aware how ridiculous it sounded. She was baffled. I was baffled. We started to play, the family danced again. The message got to our singer, Jeff, who was also baffled. We did what we had to: we invited them up after the last song of the set. The kid sat on his grandfather's lap and the grandfather held the kid's hands with the sticks in them and they played a pretty darned good version of "Road House Blues..."
I did fear for the kid's shoulder-sockets, but he seemed to come through it unscathed and he got some energetic applause, so, no harm done.